TORONTO - The wife of a Canadian citizen who is serving a life sentence in China for speaking out on behalf of the country's Uighur minority says the Canadian government has all but forgotten about him. Kamila Telendibaeva says her husband, Huseyin Celil, a refugee from China's troubled Xinjiang region, has been punished because he spoke out about the democratic and religious rights for the Muslim minority group. Human rights activists say Beijing considers anyone in the Uighur community who attempts to promote their culture or religious values, or who speaks out about greater autonomy for the Uighur people, a terrorist. Junior foreign affairs minister Diane Ablonczy says her department was engaged in Celil's case but admits diplomatic hurdles complicated the government's attempt to push for his release. She says China does not recognize dual citizenship and does not, as a consequence, recognize Canada's right to have consular access to one of its imprisoned citizens. "They have not been willing to budge off that position although we continue to press them and will continue to press them," says Ablonczy. Celil escaped from China in 1994 when the terrorism charges first surfaced. He fled to Turkey where he was granted refugee status by the United Nations High Commission for Refugees. He became a Canadian citizen in 2001, when he moved to Ontario and settled in the Hamilton area. In 2006, while visiting his wife's family in Uzbekistan, Celil was detained by Uzbek police and deported to China without the consent of the Canadian government. Rebiya Kadeer, an Uighur human rights activist now exiled in the United States, says the Chinese government sent Celil to prison to send a message to other Uighurs that China can still punish them even if they are citizens of another nation. "It was a way to signal and put fear in the hearts of Uighurs abroad," Kadeer said Thursday from her home in Washington, D.C. The Nobel Peace Prize nominee, whom China considers one of the instigators of the July 2009 riots, in which nearly 200 people were killed and more than 1,700 were injured, has experienced first hand Beijing's heavy hand. She spent six years in a Chinese prison on charges of separatism. Two of her 11 children are imprisoned in China while three others are unable to leave the country and remain under constant surveillance, she said. "If it had been a systematic forced assimilation before, it has now transitioned to essentially genocide," said Kadeer. Members of the Uighur community gathered outside the Chinese consulate in Toronto on Thursday to mark the third anniversary of the deadly 2009 riots. Attending the rally was important for a 19-year-old Uighur refugee seeking political asylum in Canada. She said her brother was arrested during the riots and several of her classmates disappeared. "That's why I've come here, because they could not say anything," said Miyesser, who did not want her last name used for fear her political activism could put the lives of her family, who are still in China, at risk. "This is a free country and maybe I can make their words heard," she said through a translator. In a report issued this week, Amnesty International said it had new testimony that Beijing continues to "intimidate" families seeking information on their relatives who went missing during the riots. Catherine Baber, Amnesty's director for the Asia-Pacific, said "the general trend toward repression that we see all over China is particularly pronounced" in Xinjiang. 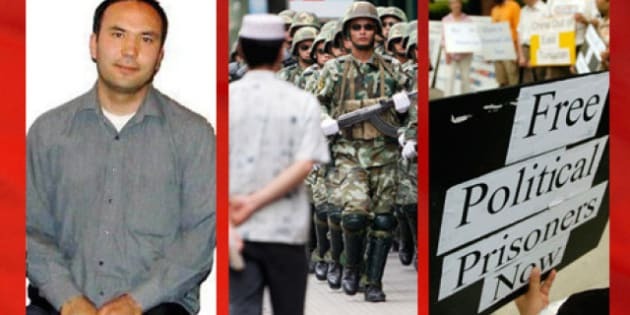 "Chinese authorities must reveal the whereabouts of those individuals subject to enforced disappearance, and end the persecution of their family members seeking answers," Baber said. Celil's wife said it's been months since she last received an update on her husband's case from the Canadian government. "I'm frustrated," Telendibaeva told The Canadian Press from her home in Burlington, where she lives with her four young sons. "I didn't receive anything from the Foreign Affairs Department and I didn't get any information from the Chinese authorities," she said. Celil's sister has been the only person allowed to visit him in prison — for 40 minutes behind a glass enclosure every six months, Telendibaeva said. No other visitors have been given access, including Telendibaeva and the couple's children. Prime Minister Stephen Harper raised Celil's case with Chinese Prime Minister Wen Jiabao during a visit to Beijing earlier this year. But Harper's strong statements on China's human rights record did not sit well with the Chinese government and may have hurt Celil's chances of release, said Wayne Marston, NDP critic for human rights. "There were times that if you handed the Chinese a note with 20 names on it of people who were detained, without too much commentary at all — three, four months later they would start surfacing and would actually get released," he said. "But if, on the other hand, you were to, like our prime minister apparently did, make the public announcement that he is going to talk to them about their human rights record, that kind of slows processes altogether," he said.